You know those meals from your childhood that you will always remember? You know how some of them are good memories and some of them are bad memories (tater tot casserole, I am talking to about you). 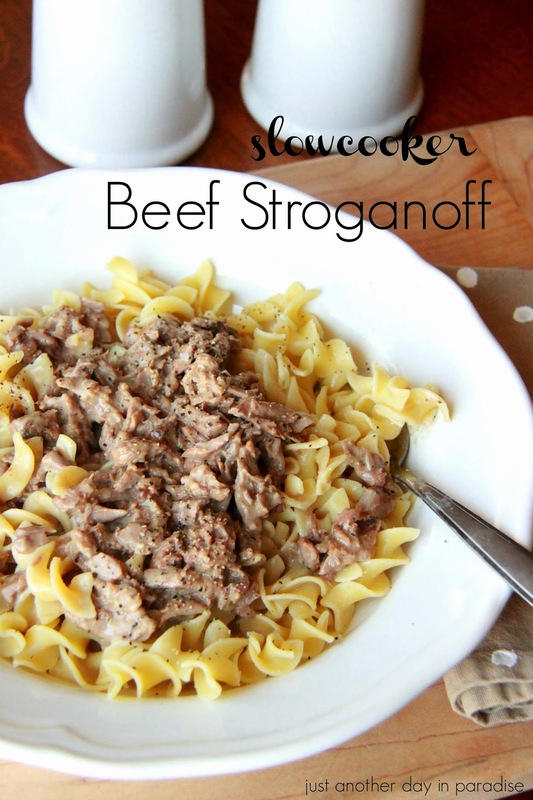 Well beef stroganoff is one of the beloved meals, right up there with won tons and taco casserole. There is something about beef and sauce over noodles. Double YUM. 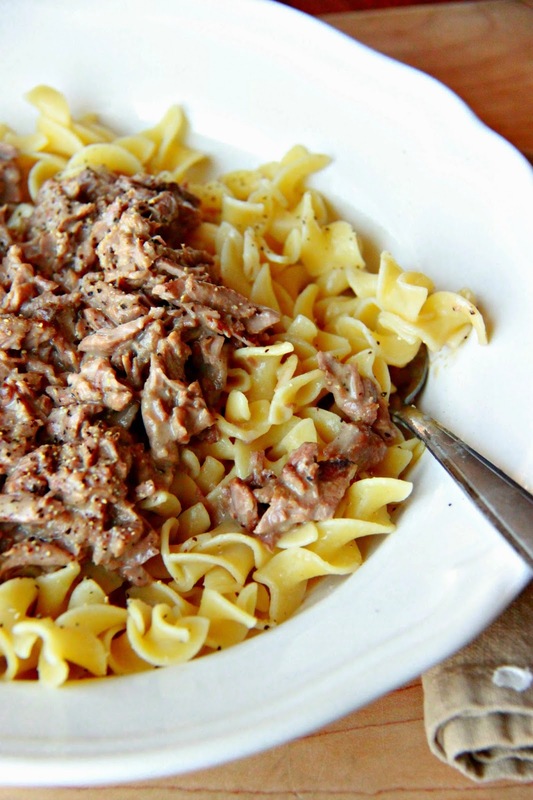 A few weeks ago, I had realized I had never made stroganoff for my kids. Hang my head in shame now. I was kind of baffled how I had yet to make one of my favorite childhood dishes for my own kids. I mean I do like them and all. Thinking on it, I realized that sometimes I am so focused on making all the new Pinterest recipes that I forget about the tried and true, time-tested ones. Do you ever find yourself doing that same thing? 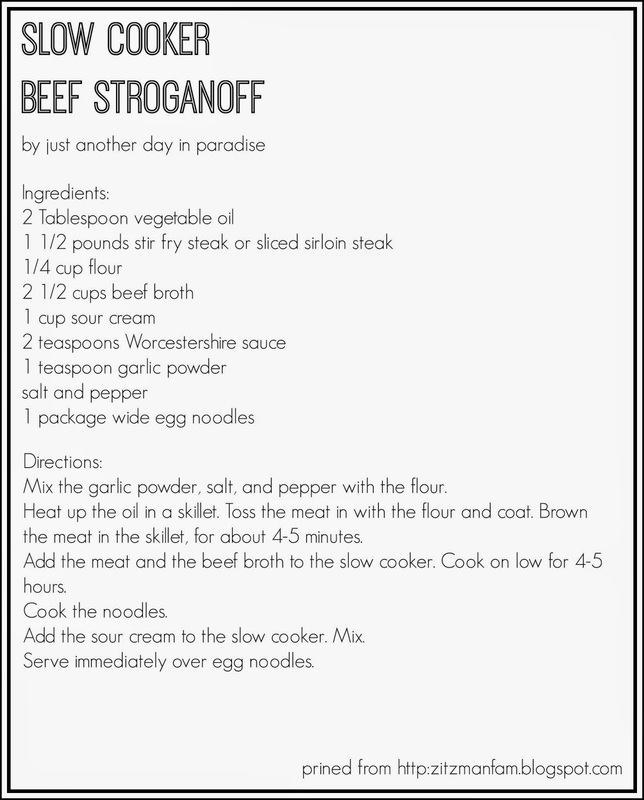 So in order to rectify my cooking atrocity, I put beef stroganoff right on the menu. I did change it up a bit from my childhood version. Don't worry, it is just as good. I used beef strips instead of ground hamburger and I popped it in a slow cooker to let it simmer all day long. My house smelled grand all day. The kids LOVED it. Plus for a second I was transported to my 12 year old self. A few demanding, "MOM! 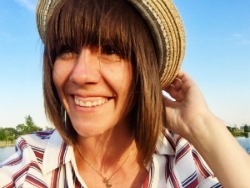 "s and I was right back. I didn't mind because I still had my beef stroganoff. The hungry people at your dinner table will love every last bite of this meal. I think Mark might actually like this version. He has not liked the stroganoff I've made in the past (I know, crazy! ), but it has always had mushrooms. I wonder if the lack of mushrooms or cream of mushroom soup would change his opinion. This looked so good that I'm making it tonight! When do you add the Worcestershire though? I am reading the recipe wrong? You add the Worcestershire with the broth! Ack...forgot to put that on the recipe. Sorry! When do you add garlic powder?